تشمل صناعة المركبات تصميم، تطوير، تصنيع، تسويق و بيع المركبات. و في عام 2007، تم إنتاج أكثر من 73 مليون مركبة حول العالم، بما فيها الشخصية والتجارية بأنواعها المختلفة مثل الحافلات، الشاحنات، سيارات الأجرة و عربات النقل . و في نفس العام، تم بيع 71.9 مليون مركبة جديدة حول العالم، منها 2.4 مليون في الشرق الأوسط. ويوجد الآن حوالي 806 مليون مركبة حول العالم، تستهلك المركبات ما مقداره 260 مليار برميل من الوقود بنوعيه البنزين و الديزل كل عام. خط تجميع سيارات لوتس النهائي. خط تجميع في مصنع سيارات هيونداي موتور في كوريا الجنوبية. دايملر holds a 19.9% stake in كرايسلر. The مجموعة رينو-نيسان موتورز alliance involves two global companies linked by cross-shareholding, with Renault holding 44.3% of Nissan shares, and Nissan holding 15% of (non-voting) Renault shares. بورشه announced on 6 يناير, 2009 that its stake in Volkswagen now exceeds 50%, making Volkswagen Group (and its associated marques) its subsidiary. The مجموعة فولكسفاغن holds a 37.73% stake in سكانيا (شركة) (68.6% voting rights), and a 29% stake in مان (شركة). شركة فورد holds a 13.4% stake in مازدا and an 8.3% share in آستون مارتن. جنرال موتورز still holds a 3% stake in سوزوكي. GM is currently in the process of selling the 3% stake back to Suzuki for $230 million . Suzuki is also partner with GM in دايو and CAMI. مجموعة رينو holds 20.5% of the voting stakes in فولفو. تويوتا holds a 51% stake in دايهاتسو hence having a controlling interest in the company, and 16.5% in فوجي للصناعات الثقيلة, parent company of سوبارو. جنرال موتورز and تويوتا have a joint venture in New United Motor Manufacturing, Inc, an automobile plant in فريمونت (كاليفورنيا). كرايسلر is currently engaged in negotiations with فيات كرايسلر that would have Fiat take a 35% stake in Chrysler. جنرال موتورز and SAIC have two joint ventures in Shanghai General Motors and SAIC-GM-Wuling Automobile. مجموعة فولكسفاغن and SAIC have a joint venture in Shanghai Volkswagen Automotive. The table below shows the world's largest motor vehicle manufacturing groups, along with the ماركةs produced by each one. The table is ranked by the latest production figures from OICA 2008 for the parent group, and then alphabetically by marque. ملاحظات؛ * جنرال موتورز is in the process of selling همر to Sichuan Tengzhong, ساب للسيارات to Spyker, and eliminating بونتياك and زحل. ** Porsche is listed as parent company of مجموعة فولكس فاجن. This is only the case since January 2009, when Porsche acquired more than 50% of the shares of Volkswagen. *** شركة فورد is looking to sell Volvo. **** مجموعة هيونداي كيا للمركبات owns only a minority stake in كيا. 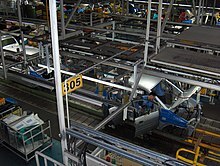 It is common for automobile manufacturers to hold stakes in other automobile manufacturers. These ownerships can be explored under the detail for the individual companies. Only relationships within the Top 20 are mentioned here. دايملر holds a 6.75% stake in تاتا موتورز. Fiat S.p.A. will hold a 20% stake in كرايسلر, as part of the 'Chrysler Plan'. When Chrysler has paid back all government loans, Fiat's stake will increase into a majority stake, effectively making Chrysler and its marques subsidiaries of Fiat. شركة فورد holds a 13.4% stake in مازدا. Porsche Automobil Holding SE announced on January 6, 2009 that they own 50.76% of مجموعة فولكسفاغن, making the Volkswagen Group and all its marques subsidiaries. مجموعة رينو-نيسان موتورز alliance involves two global companies linked by cross-shareholding, with Renault S.A. holding 44.3% of Nissan Motor Company shares, and Nissan Motor Company holding 15% of (non-voting) Renault S.A. shares. مجموعة رينو holds a 25% stake in أوتوفاز. تويوتا holds a 51% stake in دايهاتسو, making it a subsidiary. تويوتا holds a 16.5% in فوجي للصناعات الثقيلة, the parent company of سوبارو. مجموعة فولكسفاغن holds a 37.73% stake in سكانيا (شركة) (68.6% voting rights), making Scania a subsidiary of Porsche Automobil Holding SE, since the Volkswagen Group itself is a subsidiary of Porsche Holding. ^ Plunkett Research, "Automobile Industry Introduction" (2008) نسخة محفوظة 19 ديسمبر 2010 على موقع واي باك مشين.